Kamloops Ford Lincoln’s Customer Loyalty Advantage program is an exclusive program and it is FREE to all customers that service their new and used vehicles with Kamloops Ford Lincoln, where loyalty is appreciated. We work hard to provide you with affordable prices for regular maintenance, parts and labour. We are a local business that works hard to bring you the best value and service for your vehicle and we service all makes and models. Bring your vehicle in for a FREE Car Wash & Vacuum on your birthday! No appointment required. Discounts apply to vehicles maintained at Kamloops Ford Lincoln. Your provided key card is valid for one vehicle and is non-transferable. This program is not redeemable for cash and cannot be used as a credit card. This key card must be presented at time of purchase. Only one key card may be used per purchase. 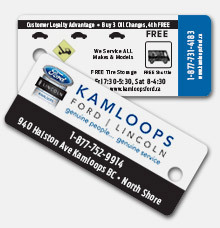 Kamloops Ford Lincoln is not responsible for loss, theft or unauthorized use of the key card. * Key card must have three punch holes and service history confirming the Oil & Filter Changes have been purchased. Customer is responsible for all levies and taxes. ** No-charge tire storage is offered to customer with purchase of season tires. For example, if you purchase winter tires at Kamloops Ford Lincoln we will store your summer tires at no charge. This offer does not include the cost of balancing the tires.